Ninja says he feels “blessed and honoured” after winning two Esports Awards. The streamer picked up Personality of the Year and Streamer of the Year at the event in London on Monday. The 27-year-old has 11 million followers on Twitch. 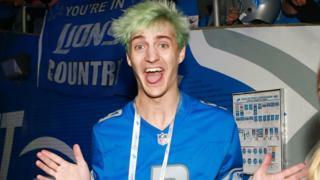 It makes Ninja the most followed streamer on the platform. Twitch itself won Streaming Platform of the Year – beating Facebook, YouTube and Znipe. Call of Duty was another big winner at the awards ceremony – winning three out of its nine nominations. 100 Thieves pro player Kenny “Kenny” Williams won Console Rookie of the Year. Clint “Maven” Evans, a presenter for CoD, was voted Broadcaster of the Year. He was commended for his work during the WWII season, especially the Call of Duty World League event in August. Esports Broadcaster of the Year at the @esportsawards !!! Professional Call of Duty player Attach from FaZe Clan won Best Play of the Year. He thanked fans and said it was “insane” to win. Thank you to every single person who took the time out of their day to vote for myself and the other Call of Duty Players/Casters! Love to see the community working together. It felt great to see a couple people from COD Win tonight! Overwatch won Game of the Year, while Fornite won Breakthrough Game of the Year. Astralis (CS:GO) said they were “extremely thrilled and happy” to win Team of the Year. They couldn’t be at the awards ceremony but thanked fans for their support in a video message. We’re the @esportsawards “Esports Team of the Year”! You can watch Astralis in action at the recent CS:GO Major in London on The Radio 1 Gaming Show.